It’s not every day one talks to a musical legend. But today is that special day. 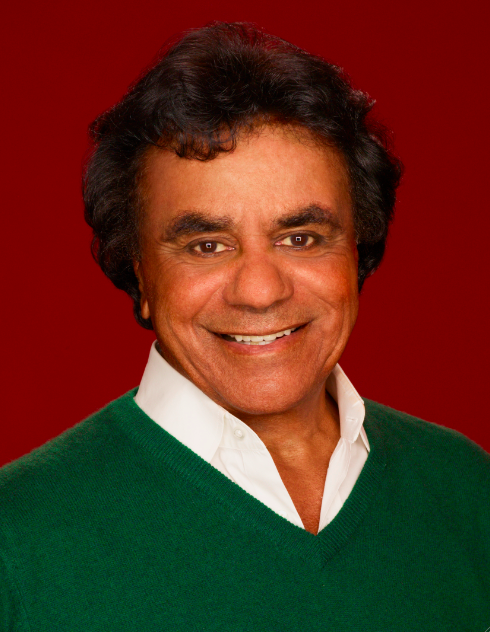 When I speak with Johnny Mathis on the phone, his indefatigable energy is everything I hope from the musical maestro – lyrical, positive and ready to chat about his career. His is a long and successful story, to say the least – he and Barbra Streisand are the longest running vocalists on Columbia Records, as a matter of fact. In fact, the effervescently youthful 79-year-old Mathis, who is celebrating his 60th year in show business, is much like the title of his 1957 hit, “Wonderful, Wonderful.” That wonderful career of his has been a nonstop activity of hits and musical acclaim, with a fan base that is legion. His singing started as a child, and he admits, “My dad was a singer and also my best pal. One day, when we lived in San Francisco, he came home with a pile of wood – it was a piano that he assembled by himself. He sat down and played and, of course, I was an avid listener. He was a big asset to my singing since he saw that I was interested… and he saw I might have my talent.” When I ask who, besides his father, influenced his career, Mathis is ready to reminisce on how music affected his life. When I mention his album, ”Open Fire, Two Guitars” is one of my favorites and that the little known Mathis album reminds me of Cole, he recalls, “I loved doing that. It was spur of the moment with how it came about. The guitarists were absolutely marvelous and we did that with Percy Faith.” Faith, a musical direction genius, was known for giving acts the lush, orchestrated accompaniment with which Mathis is still identified. When fame came knocking at a young age in the 1950s with hits like "It's Not For Me to Say," "Chances Are," "A Certain Smile," "Misty," "Gina," and dozens more, Mathis became a fixture on television and nightclubs as he toured the country. With stints on “The Perry Como Show,” “The Andy Williams Show,” “The Ed Sullivan Show” and a plethora more of the era’s T.V. staples, he helped break the segregated color barrier at the time and represented tremendous potential to African Americans when too few were on mainstream television and having huge hits like he was. Another influence of his success? There were his ladies, as he calls them. Ella Fitzgerald, Lena Horne and Jeri Southern inspired him and when his fame afforded the chance to meet and work with them, he knew he’d really made it. I ask Mathis about the oft-forgotten vocalist June Christy from the era when he came of age since I thought he might have an affinity for her. “Are you kidding? We toured together with the Hi-Lo’s. Her voice was so sensual and she was the most charming lady.” He also counts going to Brazil early in his career, which had an effect on him as the region’s Bossa Nova music was just starting to become the phenomenon it would later be. “It was an eye-popping experience and I fell in love with the people, music, weather and scenery,” he states. “Then in the 70s, with its “anything goes” approach, that was the only real lesson I had,” he goes on to say. “I was singing at the Sands Hotel in Las Vegas and I had just received an award by “Time” magazine and Ron Postal [the celebrity tailor who also dressed the James Bond movies and Steve McQueen] made me an outfit. It turned out to be so uncomfortable while I was singing I stopped the show. I told the audience that if they could be patient I would change clothes upstairs and come back down to sing. It was a matador-type of outfit. Not very me.” Lesson learned, Mathis sang through it like he sang through the 50’s up until the 70’s with a comeback of sorts, and his voice still resonates vibrantly with audiences today in 2015.